Path to Scholarships®: Graduated Debt Free After Attending Four Colleges Using Path to Scholarships®! Graduated Debt Free After Attending Four Colleges Using Path to Scholarships®! Eva Vaquera-Contreras attended four different colleges and graduated debt free! She speaks very highly of Path to Scholarships® because she was awarded thirty-five scholarships following the proven strategies and using the tools provided in the Path to Scholarships® College Edition. Eva also attended a Path to Scholarships® workshop, which guided her through the Five Steps to organize a winning college and scholarship portfolio to successfully apply to college and for all the scholarships she was awarded! Eva Vaquera-Contreras is from Zacatecas, Mexico. 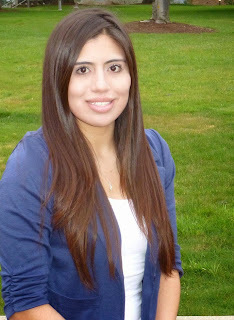 Eva completed her final semester of nursing school at Linfield Good-Samaritan School of Nursing. She graduated in June 2013 with a Bachelor of Science in Nursing. Eva plans to build her nursing experience by working as a Registered Nurse within her community. She wants to assist the Spanish speaking population by providing bilingual nursing care. Eva also gave a student speech at the Hispanic Chamber scholarship luncheon in Portland, Oregon. That's so great that there are some programs that allow students to start their career immediately upon graduation. It's much easier to do this when you are debt free. Thank you, Path to Scholarship. You are amazing!